Melissa Tran, who took first in Debate for the Team trophy, and Nathanial Leonhardt, who took 2nd in Lincoln-Douglas (Debate), pose with the team’s trophies after earning first place in state. 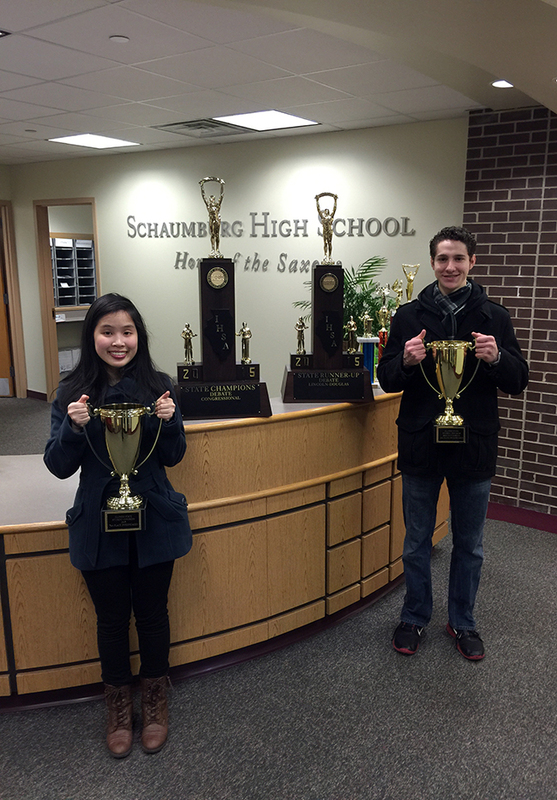 Schaumburg High School Debate Team students are celebrating a successful season and earning the title of state champions. The 2015 IHSA Debate State Congressional Championship team competed against over 200 competitors from more than 25 schools at the beginning of the tournament. After an elimination break, the competition was narrowed to 63 competitors. Only 16 students advanced to the final round and Schaumburg students were five of those finalists. The team will be recognized for its accomplishments by the Board of Education at its April 9 meeting. The team consists of seniors Melissa Tran, Kimberly Jimenez, Kruti Merchant, Shraddha Patel, Rebecca Lii, Valeria Gololobova, juniors Srini Cherukuri, Karolina Skarzynska, and sophomores Kshitij Vashi, and Sarah Liu. This is the third time in four years that SHS has won the IHSA State Debate Championship. The team placed 2nd the year they did not earn the state title. Darrell Robin, head debate coach and English teacher at SHS, said a common strength throughout the years has been four-year debaters on the team. Representing the team in the final round of the congressional debate was Debate Team Captain Melissa Tran. She argued whether or not there should be a resolution that allows the country to negotiate ransom amounts on kidnapped citizens. In Debate society, there are three divisions in which Schaumburg competes: Congressional, Lincoln-Douglas, and Public Forum. Schaumburg won 2nd Place in Lincoln-Douglas Debate (Philosophical Debate) this year with seniors Nathaniel Leonhardt, Ameel Sheth, Sarah Bier, and sophomore Hannah Hyman. The team also reached the semifinal berth in Public Forum Debate with the help of juniors Craig Soares, Cole Miller, Jessica D’Souza, Raza Haque, senior Zohra Tabassum, and sophomore Adrian Chendra. Raza Haque, who helped the team win State last year, was also named the Captain of the All-State Debate Team for Public Forum. The record that was set this year is that Schaumburg High School is the only high school in Illinois that has ever won the IHSA Debate State Championship in the three divisions of Lincoln-Douglas Debate, Public Forum Debate, and Congressional Debate. The debate team coaches also include Carl Schwartz, associate debate coach and Schaumburg High School special education teacher, former students Brook Leonhardt (’13), Elisa Galvan (’11), Safia Kazi (’10) and Sam Haque (’09). Mike Sellergren, a former Barrington High School student who was coached by Robin, Mike Knitter, freshmen supervisor, and Nancy Israel, Dundee-Crown English teacher, also coach twice a week.